Purple Plum Fairy: PLDT myDSL's INTERNET to SAWA TRANSFORMS my INTERNET experience from totally BORING to FANTASTIC! PLDT myDSL's INTERNET to SAWA TRANSFORMS my INTERNET experience from totally BORING to FANTASTIC! I was a regular commoner blogger before I became part of Nuffnang. When I started my blog, I thought I'd just write anything and everything I wanted to write online--I figured, it's just going to be an online account of my daily life. Meaning to say, I'll just have an online diary. I didn't know I'll be having readers from other parts of the globe. And to be honest, I didn't really know what to expect from blogging. But I came across this cool blogging community through the internet called Nuffnang. It's Asia's first and leading blog advertising community. Their online platform allows advertisers to serve graphic or video based advertisements onto more than 100,000 blogs hosted in various platforms. Nuffnang even holds office in four different countries such as Australia, Singapore, Malaysia and the Philippines. With well-known brands such as Citibank, Proctor & Gamble, Sony, Nokia, Nestle and Nike as their clients, one can never go wrong! What I love best about Nuffnang, is that aside from blog advertising, they even hold contests for bloggers, organizing seminars, workshops, parties, events, movie screenings--supporting bloggers in every step of the way. Giving us, bloggers the chance to meet each other in person, learn camaraderie and gain new friends from the blogosphere. Soon, I was able to gain more followers and friends as well. From a regular blogger, I've blossomed into a proud Nuffnanger blogger! I've always wanted to have a faster internet access. I hate seeing my mac browser uploading photos and downloading files that all seemed to take forever. I abhor watching youtube videos because I know it would always be a boring experience as I sat in a corner waiting for my pc to totally stop buffering. That's why I also don't go into live streaming even if I wanted to...for I know pretty much my internet provider won't be able to satisfy my hunger for knowledge and thirst for faster internet speed. The worse part is that when I am doing something really important online and then suddenly, I'll be surprised to know I got disconnected from the internet. I swear, that REALLY drives me INSANE! It's such a good thing that blogger.com saves your draft blog posts automatically. But sometimes, even that fails me. As a blogger, my life depends on the blogosphere--hence, I need to be online almost ALL the Time. And the only way to do that is by having a reliable and excellent quality internet service provider such as PLDT MyDSL. 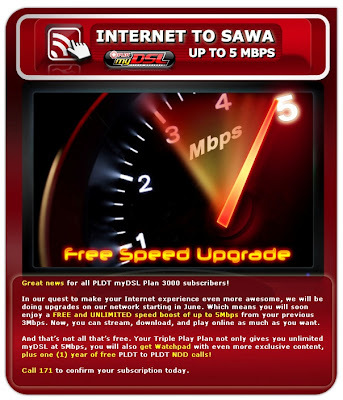 A friend of mine had introduced PLDT's myDSL's Hi-Velocity Internet to Sawa offering. She had been raving about this new PLDT offering since she had availed herself of the said service. At first, I was hesitant to give it a try. I was thinking, it may promise speed and unlimited internet service, but will it be better than my old unreliable broadband USB stick? It didn't take long for me to eventually ditch my old broadband stick for a PLDT myDSL subscription. It turned out, I made the right choice. From a really totally BOOOORRRINGG internet service, my online blogging and social networking life had instantly been TRANSFORMED into a FANTASTIC internet experience each time I go online. No more endless buffering, no more disconnection without my knowledge, no more unpleasant internet service. What do I get for a change? The result was indeed, crystal clear, fast, extraordinary internet service at its best, only from PLDT's myDSL! What's more? With a PLDT myDSL subscription, one can enjoy the latest perks that PLDT has to offer. You can watch free live streaming for free from 20 channels, so be ready to chat, blog and share. They even have the lowest IDD rates exclusive to myDSL subscribers. 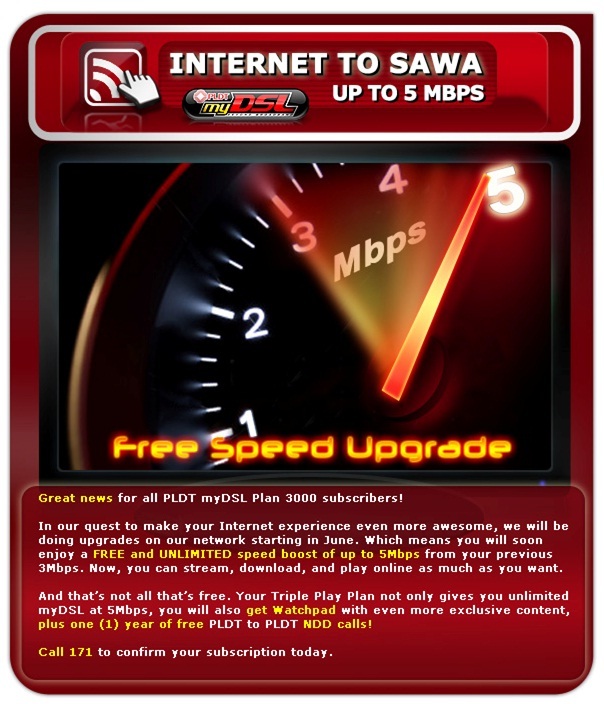 Enjoy PLDT myDSL plan 3000 and have unlimited internet with a free speed upgrade from 3mbps up to 5mbps! With the power now in my hands of full internet speed with no interruption and endless buffering/loading time, I could do more things because I no longer need to wait for so long. So aside from checking my emails regularly, updating my blogs, chatting with friends on Facebook and posting my tweets on Twitter--I could also whip dishes for my family, clean my stuff and help Kyle with his school assignments. Hopefully, I could also win tickets to the special movie screening of Transformers 3: Dark of the Moon sponsored by Nuffnang and PLDt myDSL. Kyle will be very happy if we would be invited to the said screening. This early, I want to thank you Nuffnang and PLDT myDSL! For more information and further details, please visit www.myworldmydsl.com or call 171 to confirm your subscription today!